Happy Easter to those of you celebrating today! Things are chugging along as usual for me today: mostly work, a little time with my Mom, and dinner with a friend later tonight. I’ve never been very attached to the Easter holiday, but I do think that it’s a nice time to take the idea of resurrection to heart, and celebrate new beginnings. In the last year or so, my mom has had a little rebirth of her own when it comes to health and self care. Along with some help from yours truly, she joined a gym (to which she is impressively committed), reduced her dairy consumption to a very few items, and started to be more mindful of how many animal proteins she’s consuming. The results are terrific so far: she’s slimmer, her cholesterol has gone down, and she feels more energetic and active. Hooray! As we all know, transitioning into healthier habits is a long journey, with many stops, diversions, distractions, and steps back along the way. Lately, my mom has mentioned that she feels as though she’s plateaued in her healthy eating efforts, and fallen back into some bad habits. Of course that’s fine, I said, and natural. But let’s figure out what the pitfalls are, and how we can improve further. When I was counseling clients, I realized quickly that there’s often a gap between how people perceive their habits, and the habits themselves. Most of my clients were quick to assure me that they didn’t eat processed food or junk food, but when I’d visit apartments for cooking demos, or even peer into peoples’ food diaries, I’d start to see white flour, sugar, and processed stuff popping up, little by little: the box of Pepperidge Farm here, the fluorescent sports drink there. The giant muffins recently consumed at a corporate meeting, the Kool Whip lurking in the back of the fridge. That kind of thing. Now, I’m a huge believer that what we do most of the time outweighs the splurges or special occasions we indulge in some of the time. But I also like to challenge my friends, readers, and family to do their very best, and sometimes this means taking a close look at less-than-ideal habits, and slowly starting to replace those habits for good with more wholesome ones. Until recently, my mom seemed to think she had cleaned up nearly all of her habits, but over the weekend, she also confessed to a few “occasional” habits that have become more than occasional. This include store-bought baked goods (which I’ll talk about today), and too much dependence on oils and added fats in her cooking. We’ll talk about the latter tomorrow (don’t worry, I’m still as pro-healthy fats as usual—but discernment is key!). Back to baked goods! As you all know, my skills as a baker have blossomed only in the last few years. 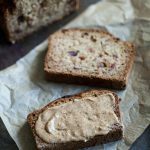 I’ve quickly found, however, that there is simply no surer way into peoples’ hearts—and no better way to encourage them toward veganism—than through healthy baked goods. My mom has said outright that she needs some sweets and quickbreads in her life as an occasional treat; I’ve told her that it’s fine, as long as she can get used to the taste of muffins and cakes that are made with whole grain flours and far less sugar than is conventional in baking. She’s open to it. And since she’s also on a dried apricot kick right now, I decided to merge her two favorite baked goods—muffins and scones—into these adorable little apricot almond “scuffins” yesterday. What a nice way to greet Easter morning today! I think of these as scuffins because they’re denser and more crumbly than typical muffins are. This was intentional, and I used almond meal in place of some of the flour for that very reason. They’re also far, far less sweet than you may be used to; I think this is one of the recipe’s strengths, but you can modify the agave to be 1/2 cup if you need to (right now it’s 5 tbsp agave, or 4 tbsp + 1 tsp stevia if you want to limit the sugar further). 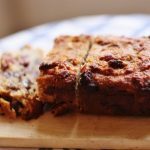 The nice thing about baking with less sugar is that your tastes will adjust over time to prefer less sweet quickbreads; I absolutely guarantee this! And a little fresh fruit along with your muffin will also help you to sweeten up the meal as a whole. The flour my Mom had on hand was an all-purpose, gluten free mix (probably from a recent visit of mine—I’m ever in new GF recipes to give my GF readers! ), so the muffins are GF—this means you can serve them to friends with gluten allergies! You may, however, use spelt or WW pastry flour instead. Almond flour means more protein and healthy fat, which helps to keep you fuller, longer. Limited oil is used (2 tbsp), which means more of the fat in this recipe comes from nuts, which have been shown to have positive effects on heart health and cholesterol. Using avocado or coconut oil will ensure that the fats used are safe for high temperature cooking. Dried apricots add natural sweetness and fiber. And the taste is lovely, which is most important of all. 1) Preheat oven to 350 degrees. Spray muffin tins with coconut oil spray (or another spray of choice). 2) Whisk together flour, almond flour, baking powder, and salt. In a separate bowl, whisk together the almond milk, flax + water, applesauce, agave, and coconut oil. Add wet ingredients to dry, and mix till all is incorporated. Add apricots, and mix again. 4) Pour mixture into a 12-muffin tin (or 2 six muffin tins) and garnish each with an almond. 3) Bake muffins for about 20 min, or until golden, and a toothpick emerges clean. Enjoy with a little fruit, all natural, all-fruit jam, or nut butter, if you wish! My mother really enjoyed these muffins. She said “they’re delicious!”, paused, and then said, “they could be a tiny bit sweeter.” I said I knew they could, but maybe eating them with berries or other fruit in the morning would do the trick. It’s great how tiny changes—eating a muffin that contains less refined sweetener along with some fresh berries, for instance—can make a huge difference. Hope you try these muffins, and enjoy them, soon! These look SO good! I LOVE apricots. One of my fave fruits! Dried or fresh, love em. I love your note “not too sweet”. I always have to cut sweets in baking up to 1/3-1/4 of recommended. Love your recipes. You are so inspiring! I love the sound of this! And although I’m normally a snob when it comes to word blends, “scuffin” sounds awfully cute. _Adore_ the story of you mentoring your mom–that’s as good as it gets. Quick Question–in the ingredients list you say baking powder but in the method you say baking soda–I’m guessing it’s baking powder, right? I love almond flour, love apricots, love coconut oil (coconut anything really) – these scuffins sound like a perfect treat. Quick question – would it work to substitute some of the almond flour with coconut flour? I have both, but I wasn’t sure if that was an acceptable substitute (I’m really enjoying using coconut flour). And speaking of vegan baked goods – it’s been completely unintentional, but the last few weeks the only baked goods I’ve made have been vegan. 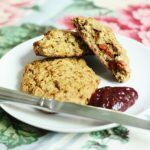 A few years ago I never would have thought vegan baked goodies could be so good – but now that I’m using coconut oil, coconut flour, almond flour, flax, chia seeds, etc., it’s so easy to veganize cookies, cakes, muffins. Yum! 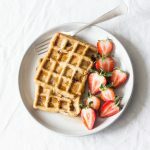 I’ve been looking for recipes that call for minimal to no sugar, soy or wheat, and I think this one looks fantastic. Hi Gena, that’s great about your mum. I have been reading your blog for nearly a year now (after reading every post you’ve made since 2009) and you have been very influential in my recent giving up of animal food products and embracing veganism and raw food– I have made many of your recipes and they are super (apple cinnamon buckwheat granola in the deh. as we speak!). I weight train and your plant based protein ideas feature heavily in my meal plans. I like the calm, compassionate ways you word your thoughts. As someone who is already beginning to feel that guilt seep in now that the lightbulb has well and truly gone off in my head, I appreciate the way you write and I never feel judged for having chosen to be an omni all this time. I also come from a Greek family and understand too well the animal-protein meals being a huge feature, particularly at the numerous family gatherings. I really hope my mum can follow your mum’s example. My mum uses olive oil in everything but she uses waaaaay too much and her “but I eat in moderation!” happens far too often 🙁 She has recently been diagnosed with diabetes type 2 and I’m just hoping she will at least read The China Study. Good on you for helping your mum. You certainly helped me and now my sister is beginning to check your site out more as she has GI issues and loves recipes that are easier on her digestive system! Love your work. Thank you from the bottom of my heart. Beautiful. For some reason I immediately imagined these with figs in place of the apricots…yum. The muffins looks great, i think i will make this! Thank you for the reminder that you can train your body to want less sugar. I have a major sweet tooth and tend to put a lot of sugar in my homemade baked goods. XD Thanks Gena! And thank you mum for her tasting expertise lol! It’ll be great to only make one batch of treats (instead of a second for the non-GF crowd). And from the looks of it, I won’t have to tell them that it’s gluten free either. They remind me of those sweet adzuki and almond paste buns from the Asian bakery that I miss way too much. Loved this! I made mini scuffins today. 🙂 I think these were perfectly sweet. I don’t like overly sweet (but of course that is after some taste bud retraining). I put a little soy free earth balance on mine and then I had one with my mother in laws amazing raspberry jam. I used dried cherries though because I don’t have any apricots. I also made my own almond flour and left some bigger pieces of almond in there which gave them a little crunch. Delicious! I will definitely be making these again. I just realized you made these for your mom! The muffins I made the other day were specifically for my mom as well. 🙂 Both of my parents have made a point to decrease their meat consumption and clean up their diets quite a bit in the past year or so. Whenever we’re all together, they are always open to anything I whip up in the kitchen. It’s so much fun! My mom is retiring this year and really wants to start making more changes to her diet [and they eat pretty healthy already]. She’s really excited and my dad’s totally up for it too. So fun! I’m simply fascinated with you working so gently and determinedly on changing your Mom’s eating habits. I am the same with my husband and kids (well, poor people have no other choice but to eat what I make 🙂 ), but I wish I had the same patience with my other family members and friends. I ate them with fresh almond milk…yum!